Join us for an evening of art, food, fun, and silent auction highlighting ourMemories in the Making program. 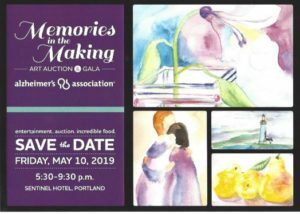 This year’s Memories in the Making Art Auction and Gala will be filled with entertainment, silent and live auction items, raffle fun, incredible food, and an opportunity to donate to a wonderful program. Auction items include fabulous vacation packages; gift baskets from local vendors; and art from local artists and participants in the program. We expect 350+ in attendance, for cocktails, seated dinner, art and silent auction. Exclusive Sponsor – $5,000 – Includes marketing and table of 8. Event Sponsor – $3,500 – Includes marketing and table of 8. Table Sponsor – $2,000 – Includes table of 8. Silent Auction – $125 + , Donate a gift basket to the silent auction. Donate Wine – $25 + , Donate wine for our wine wall auction. Not able to attend, but still want to support this event? Memories in the Making resulted from the exploration of the use of art as an alternative form of expression for people with dementia. While Alzheimer’s disease brings constant reminders of failures and losses, Memories in the Making provides a nonjudgmental environment in which participants can express their feelings. The focus is on the process rather than the product, allowing people with dementia to experience moments of joy and a renewed sense of accomplishment and self-respect.